There’s a real breadth of wheat-free and gluten-free flours now, more than ever before. It’s great as you have ample free-from flour choices that enable you to experiment with textures and flavours when you’re cooking and baking. They also provide a great way to increase the nutritional variety in your diet. 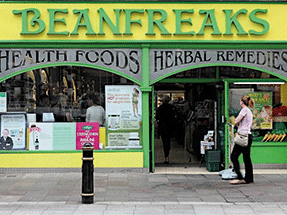 At Beanfreaks, we stock over 20 different flours ranging from artisan hand-milled flours and specialist wheat-free and gluten-free flours to nut-based flours. Each flour has a very specific texture and has properties that lend themselves well to different types of baking. Some examples of popular wheat-free and gluten-free flours include quinoa, rice, corn, potato and chickpea (also known as gram) flour. They can be combined with xanthan gum and gluten-free baking powder to produce everything from bread to pastries and cakes. Chickpea flour is great for making fruit cake bases or traditional flatbreads as it has quite a tough structure. Rice flour is another great cake base flour option. I find mixing rice flour with tapioca flour and corn flour creates a lovely blend. It certainly hits the mark if you’re looking to make a good sponge cake! Spelt is an ancient grain that lends itself well to bread making, although it can be a little too heavy for sponge cake making. However, you can now purchase light spelt flour which makes great cakes. Other ancient grain flours include einkorn and emmer (also known as farrow) which is a good option for bread or pasta making. Also known as kamut flour, khorason is a sound choice for pasta and bread making, particularly if you’re looking to make traditional flatbreads. Please note that these four ancient grains (spelt, einkorn, emmer and khorason) are not suitable for coeliacs or those with a gluten sensitivity. In addition, rye flour should also be avoided if you have a sensitivity to gluten. There’s been a big rise in the popularity of nut flours such as coconut, almond and peanut flours recently. This is largely because they have a low carbohydrate content. They’re particularly a hit with those that are following paleo type diets. Flours such as almond and peanut make wonderfully moist biscuits and cakes. Coconut flour can be tricky to bake with so I would recommend following a good recipe and using plenty of liquid. The end result is well worth the challenge though as this type of flour produces very tasty coconut pancakes. The overwhelming reason people try wheat-free and gluten-free flour alternatives is because of issues with their digestion. Additionally, the current trend towards clean eating has meant more people are now starting to think about what they eat and are looking for less processed dietary options. People may also think about trying flour alternatives if they are concerned about digestive issues associated with irritable bowel syndrome, for example. We also have customers switching to wheat and gluten-free flour alternatives as they offer a richer nutrient option to their home baking.